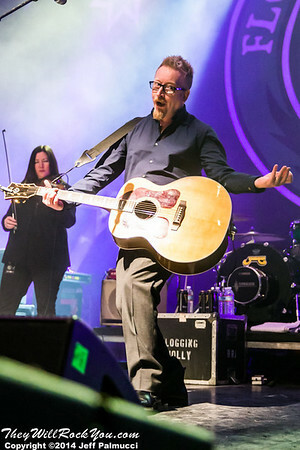 Concert Review: Flogging Molly at the House of Blues in Boston, MA : TheyWilllRockYou.com – For the love of music! Serving Boston and Greater New England. Flogging Molly played the House of Blues Boston last Wednesday to a packed house. Boston is a very Irish town and provided a lively audience for the Celtic punk band. For those of you unfamiliar with Flogging Molly: when I say Celtic punk, I don’t mean they are a punk band that simply started in Ireland. They are just as much Irish folk as anything else. To give you an idea of the atmosphere: picture a night at the Black Rose with an incredibly good and hard rocking band. Now, pack in 2400 people and add a mosh pit. This is the 10th year of Flogging Molly’s Green 17 Tour. Each year, they take to the road around St. Patrick’s Day to support Boston’s hardest drinking holiday (no, New Year’s Eve isn’t close). Other bands do well to throw picks and drumsticks to the crowd. These guys throw cans of Guinness (really). No contest what I’d rather be catching. Covering Irish bands like Flogging Molly brings me back to these wild parties. In addition to the standard rock instruments, this largish 7 piece band has people manning the accordion, flute, violin, mandolin, and banjo. These instruments help give the band their folk sound. For example, listen to Drunken Lullabies for great banjo and violin, and Devil’s Dance Floor features a flute and accordion riffing off of each other. The band played “Rise Up” as a tribute to folk singer / activist Pete Seegar who passed away this January. Seegar, always one to stand up for what he thought was right, was blacklisted and indicted for contempt of Congress during the McCarthy era. Check out his Wikipedia entry, it is an interesting read. Also credited with popularizing the banjo as an American folk instrument, Seeger got a dedication stenciled on the band’s banjo. Flogging Molly puts on a great show. For the last decade, they’ve been getting people in the St. Patrick’s Day spirit with the Green 17 Tour. So go see them and have a happy St. Patty’s day. Just keep a wary eye on the green dog. 1 Five if you count Eugene, who crashed for a while for free on the back screened in porch in a kind of semi-homeless state. 2 After we moved out of the house, we saddled Eugene and Ed’s parents with Dreyfus. I’d just like to apologize to Mrs. Sweeney for any “training” issues they may have had, and would like to point out that it was all Russ’ fault.